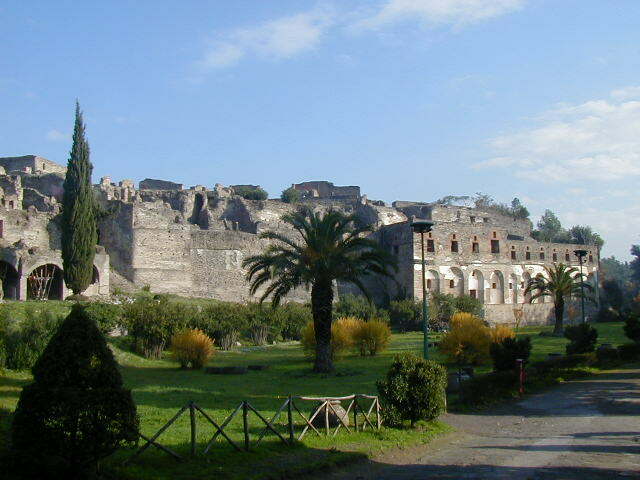 My first day in Naples I spent in Pompeii, which was the primary reason I went to this part of Italy. Entry cost 12,000 lira and, splitting the cost with four other tourists, a guide cost me an additional 30,000 lira. 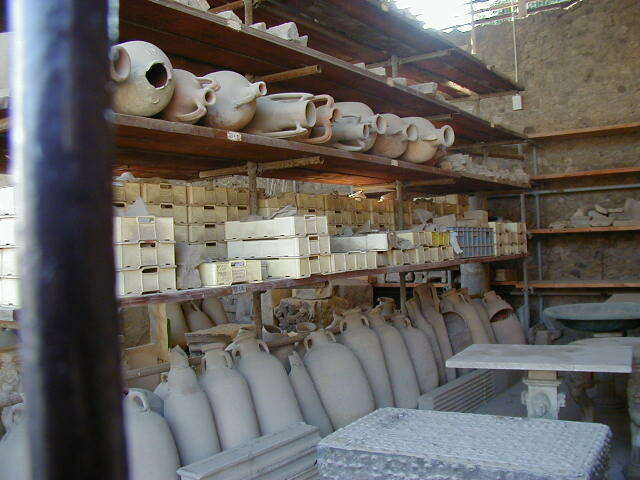 Total cost was about $20, but there is so much to see in Pompeii it helped to have a guide for a half a day. Arriving moderately early also left me a few hours to see the city on my own after the guided tour. 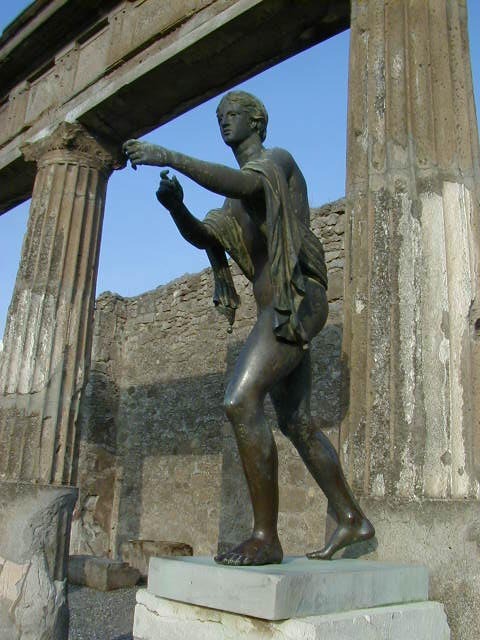 For those of you who don't know about Pompeii; WHAT IS WRONG WITH YOU? There is no excuse for such ignorance. 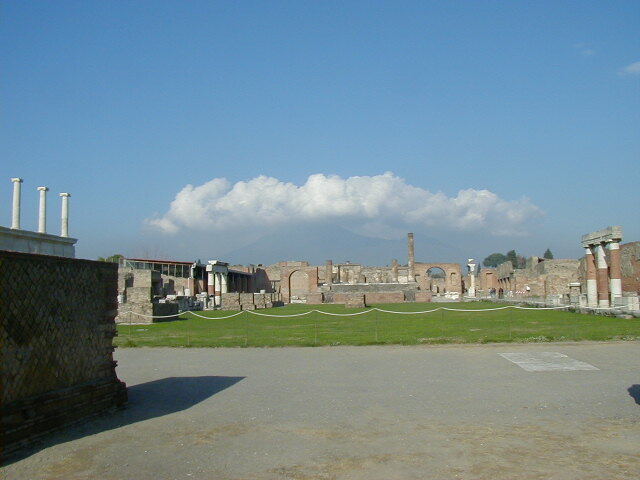 Pompeii was a port town with about 12,000 people on the western coast of Italy that was buried, along with many of its citizens, by an eruption of Mt Vesuvius in 79 A.D. The town remained buried until it was accidentally discovered in the eighteenth century. It created a great deal of excitement and activity for early archaeologists. Unfortunately early archaeologists would grab anything pretty and ship it to their benefactors, with little attention to the significance of the artifact and its context in the surrounding site. They also didn't mind destroying mundane but informative artifacts to reach the flashy stuff. 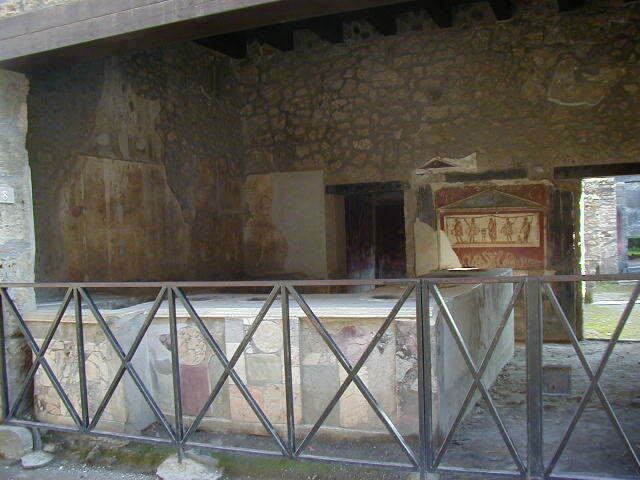 In addition to this destructive plundering, much of the marble in the forum and surrounding buildings was taken to be re-used in new construction. 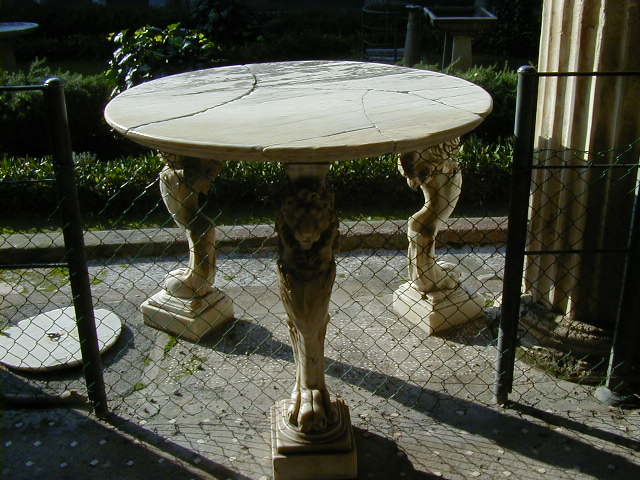 Much of the "marble" remaining isn't real marble; it is a convincing marble like stucco the people of Pompeii applied to brick walls and columns. 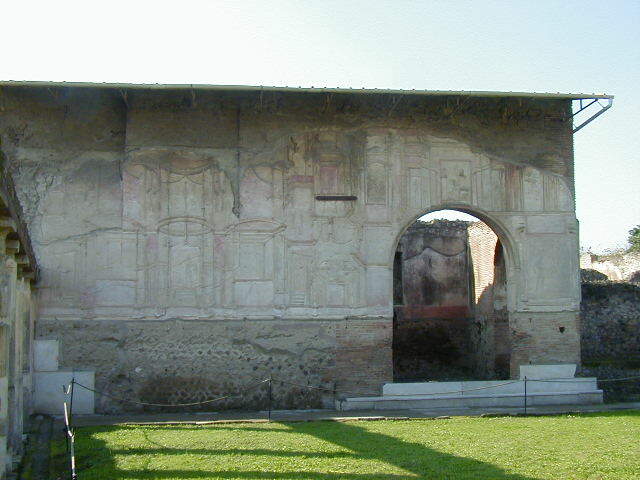 Stucco was much cheaper than real marble. Fortunately archaeology evolved into a more disciplined science before the entire town was looted. 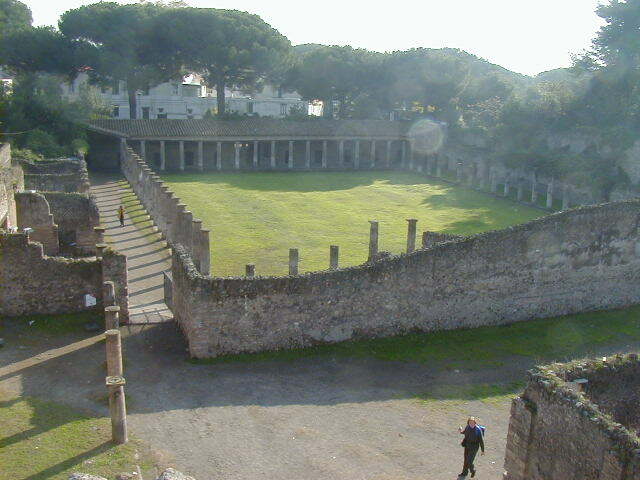 In fact there is still quite a lot of Pompeii remaining to excavate. If only there wasn't a modern town on top of the old one. 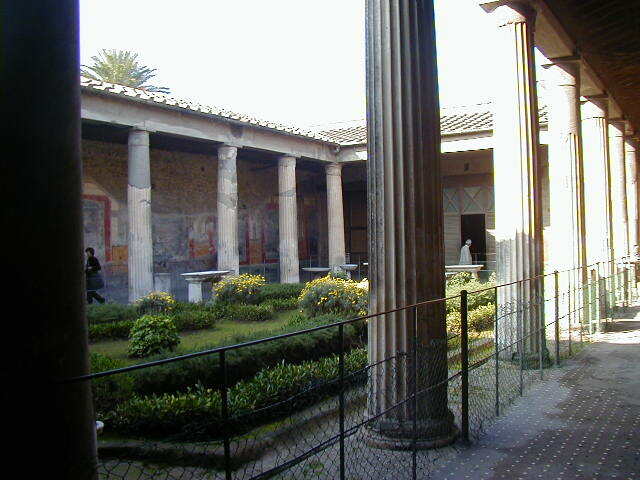 Ok, here is Pompeii; the outer walls of the city, the entrance to city, and the Basilica, which was an area of law courts and social life. 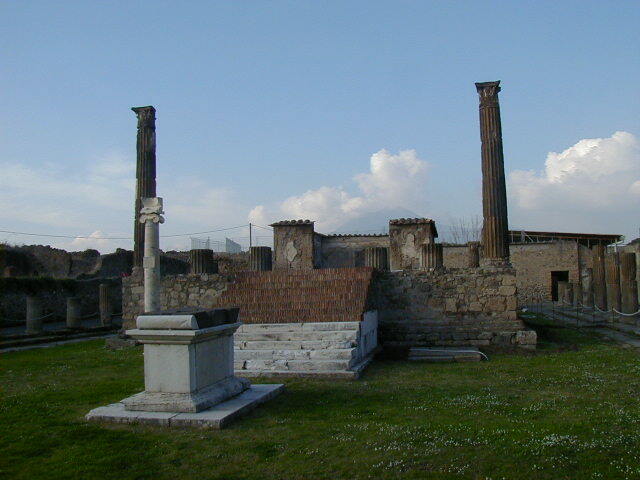 Across from the Basilica is the Temple of Apollo. 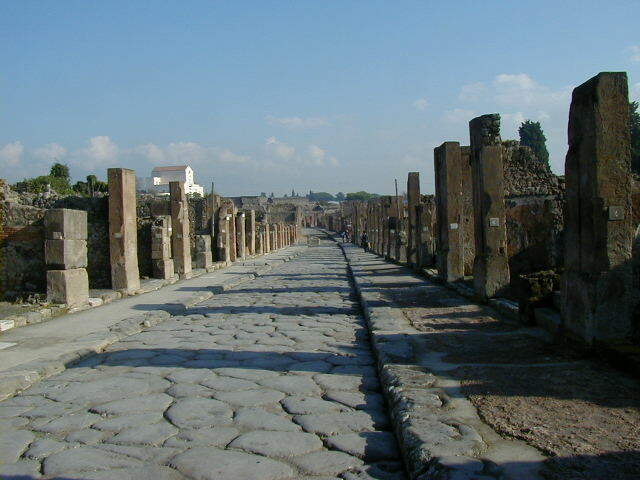 The Forum, stripped of much of it's marble, with Vesuvias in the background; some of the remaining columns of the Forum Arcade; the road leading from the Forum towards the amphitheater. 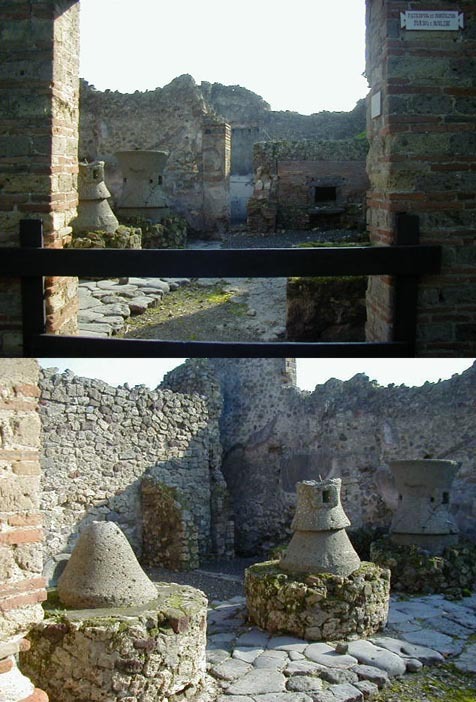 The courtyard of the Pompeii Baths, the entrance to the Baths, and an inside room of the baths. 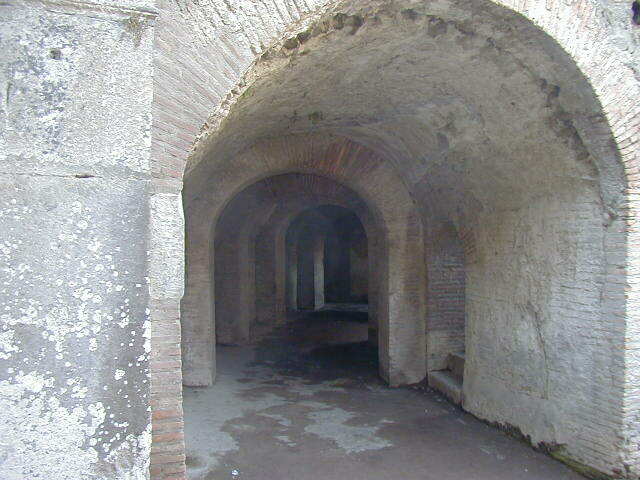 The baths, with sturdy arched ceilings, are in one of the few buildings in Pompeii that did not have their roofs collapse under the weight of the ash and pumice. 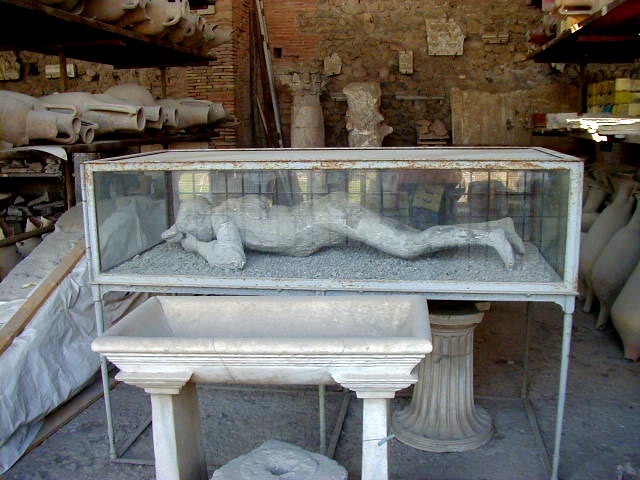 Below are plaster casts of two victims of the eruption found in the Baths. 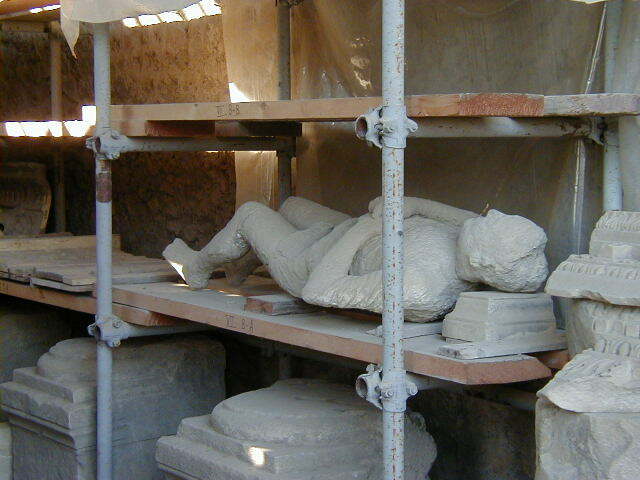 After the eruption the volcanic debris hardened into a soft stone around the victims. 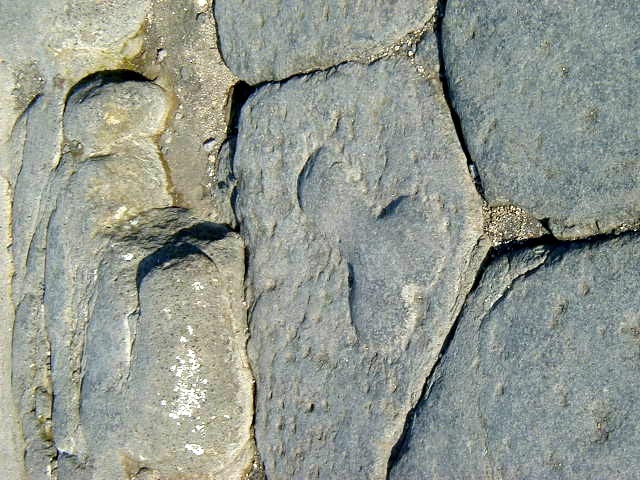 The soft tissue then disappeared one way or another--I don't know what happens to flesh that is hermetically sealed in hardened ash and mud over many centuries, but it does go away. While excavating the city workers would often find air pockets with the bones of animals or people at the bottom of the pocket. Somebody had the clever idea of halting the digging when one of these air pockets was discovered, removing the bones, and filling the pocket with wet plaster. 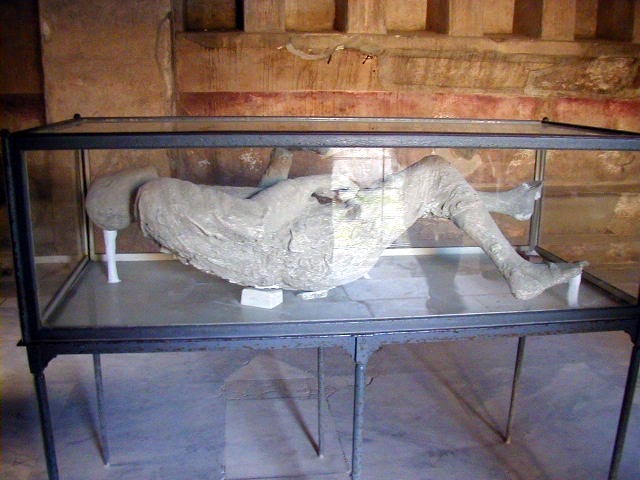 Once the plaster hardened the ash and pumice stone was removed from around it and the shape of the air pocket is revealed, which showed the form of the person when he or she had been buried. 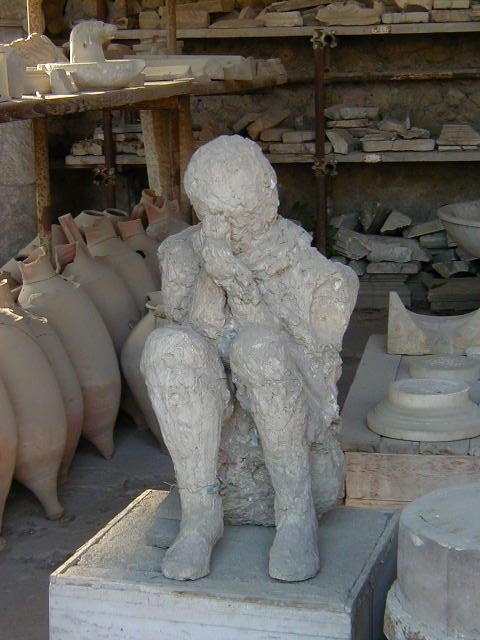 So these are not the remains of people who died in Pompeii, these are plaster casts made from the molds in the ground the victim's bodies left behind. 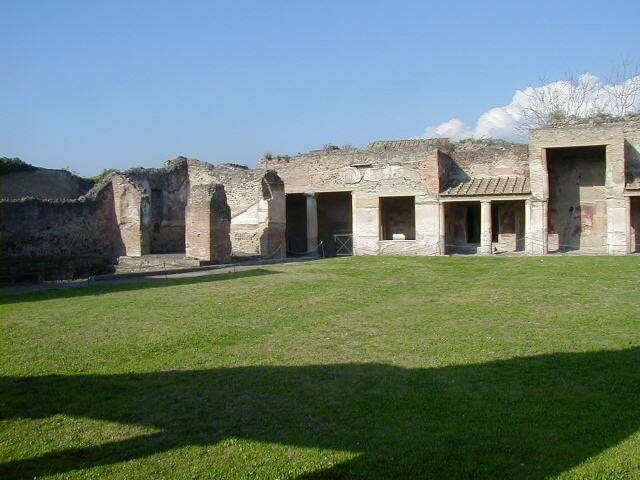 This next building shown was the main brothel in Pompeii. 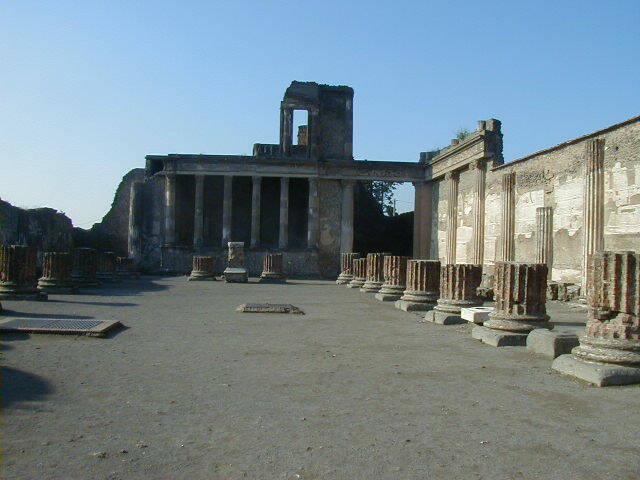 Pompeii had 34 brothels that have been uncovered so far, but a lot of the town is still buried. 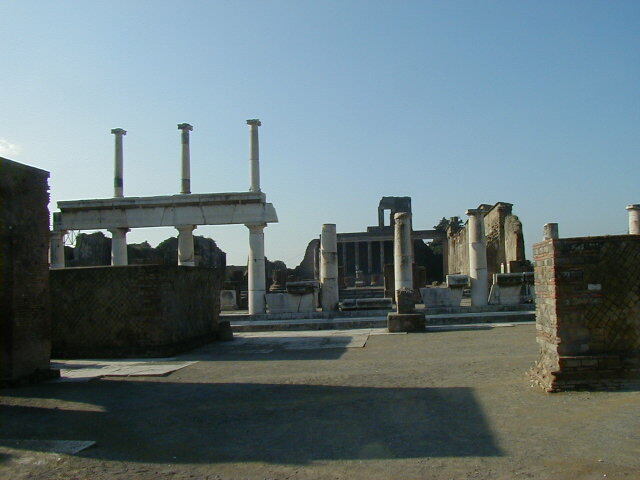 Thirtyfour may seem like a lot for a town of 12,000, but keep in mind Pompeii had a lot of tourists and sailors passing through. 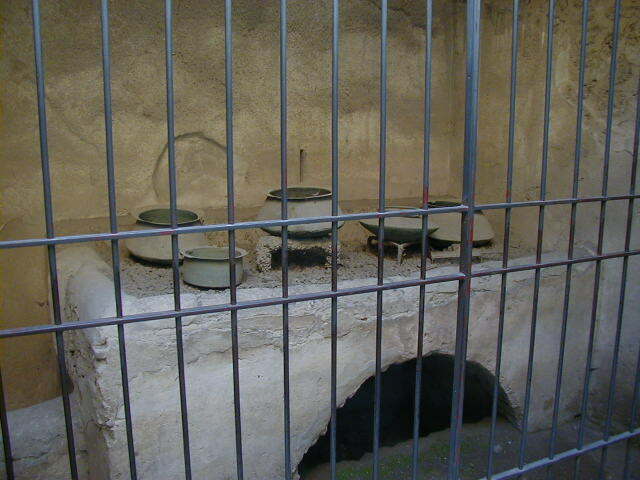 The brothels were known as Lupanare, which roughly translates to "place of wolves", and the women working there were the she-wolves. Supposedly when the women were not busy they would stand outside the Lupanare and howl. Imaging living across the street from that. 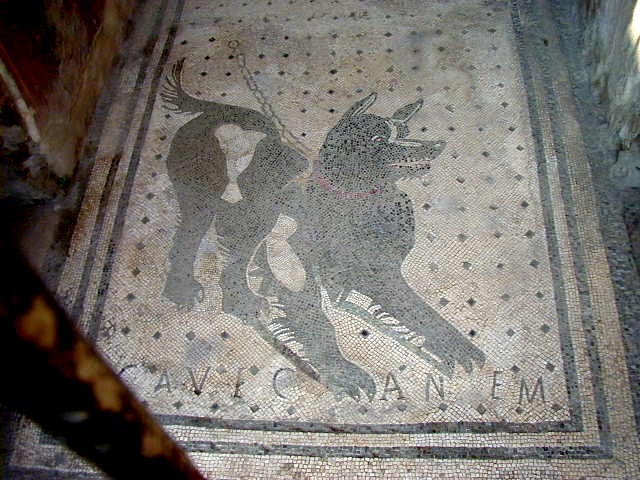 The term Lupanare raises some interesting questions about the legend of Romulus and Remus, the founders of Rome, who were raised by a she-wolf. 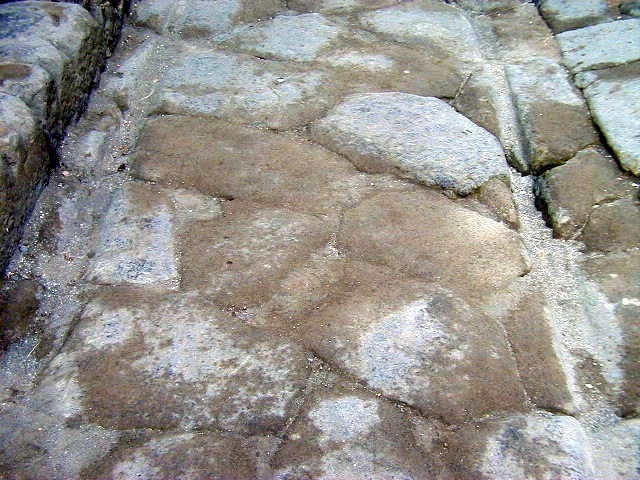 The picture after the Lupanare is the street in front of the Lupanare, showing grooves carved into the stones by traffic. This was a busy street. Further away on a cross street was an advertisement carved into the street pointing the way to the business. Easily offended people may want to skip that picture. 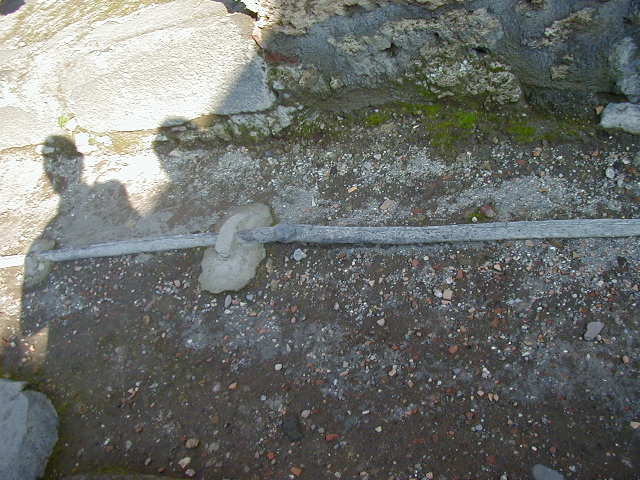 Moving on to some more mundane aspects of life in Pompeii--a picture of the lead plumbing used almost two thousand years ago. Isn't that mundane? 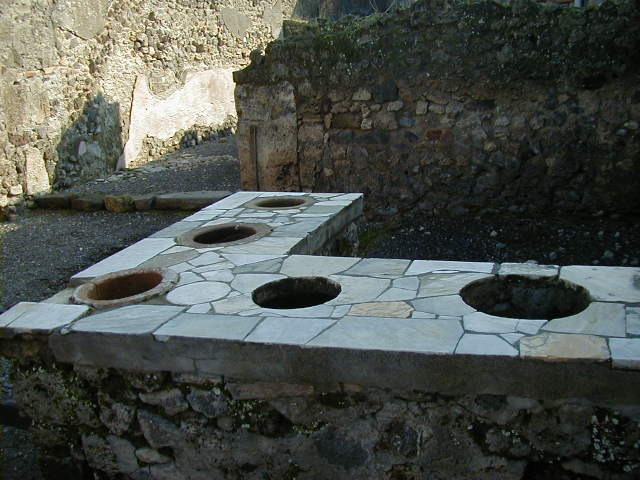 After the plumbing are pictures of one of the many fast food places in Pompeii, and a bakery, with the grinding mills and oven. 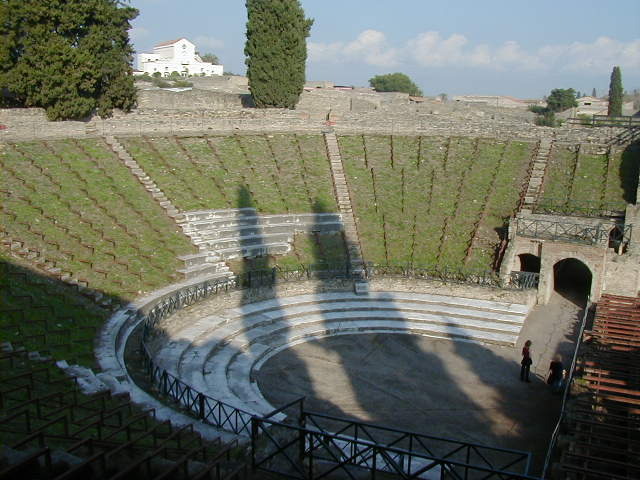 Other interesting business's in Pompeii are the theater, a fast food business on the street to the amphitheater, and four shots of the amphitheater, where the gladiator competitions were held. 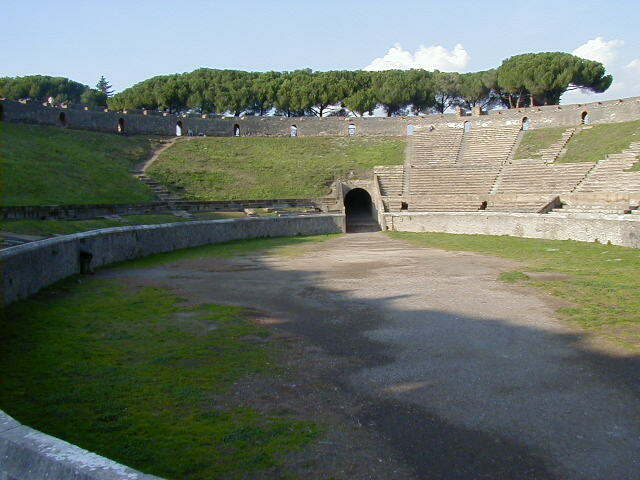 The last picture is of the Court of the Gladiators, where the gladiators lived and practiced. In two of the rooms in this area were found eighteen skeletons, seventeen of men and one of a female who had been wearing expensive jewels. You can make up your own theory about that, nobody knows the truth. Seems like a movie script, or several movie scripts, could be written around that bit of history. 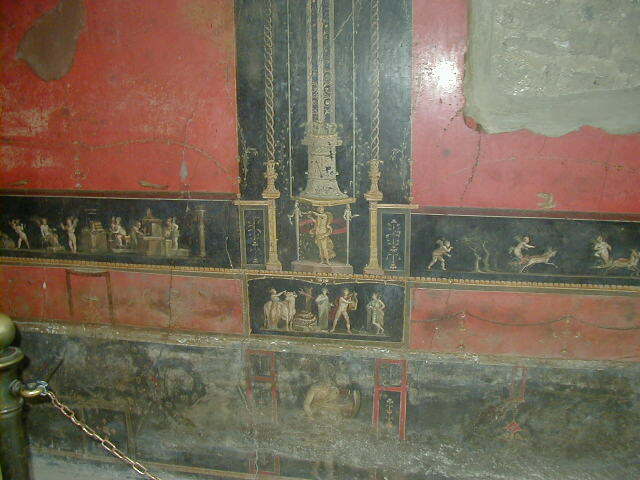 These are pictures of the House of Vetti; a rich person's house. 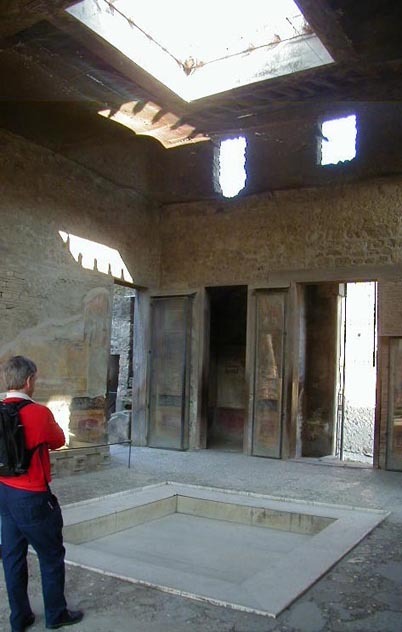 In order, there is the entrance way, with the sun roof and pool/rain water catch basin; the central courtyard; a lion legged table; the kitchen stove (only the wealthy had their own kitchen); and three walls decorated with frescoes. 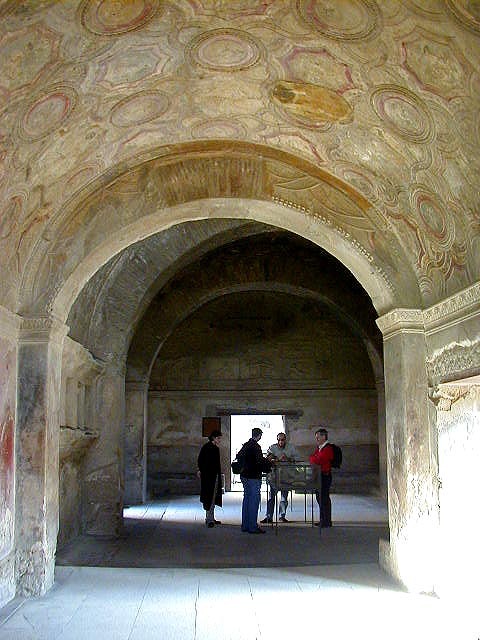 The first fresco is purely decorative, the second is painted to give the illusion of windows. 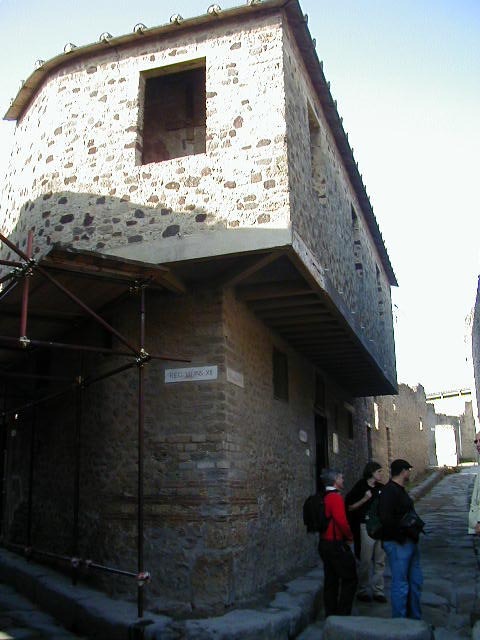 Houses in Pompeii were designed like fortresses, with only a few high windows. To make a room feel less closed in, alternative windows would be painted on the walls. 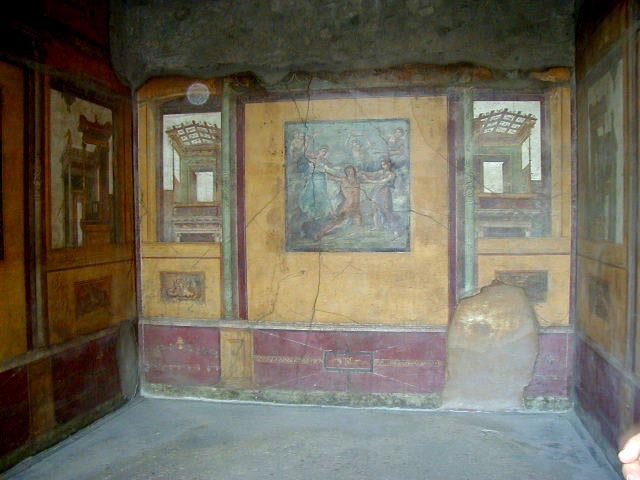 The last fresco is of Priapus, as is the fountain statue in the last picture of the series. 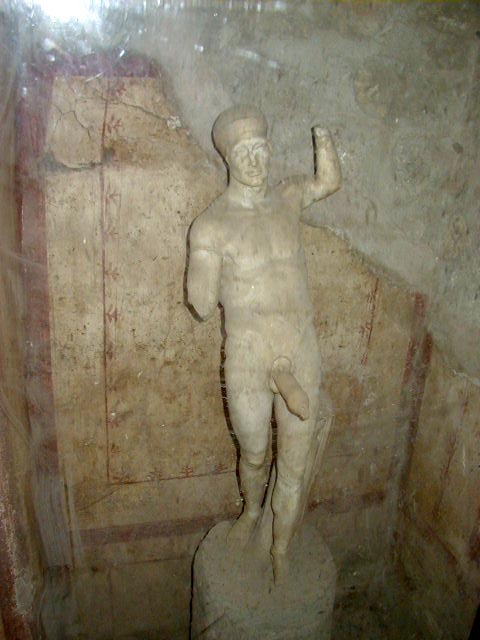 Priapus was the God of Procreation and guardian of gardens and vineyards. This was an important fellow. However, if you haven't clicked on the thumbnails yet to have a closer look, you may want to reconsider. In the fresco he is seen weighing a tray of food using his, um...well anyway, it was supposed to signify prosperity. 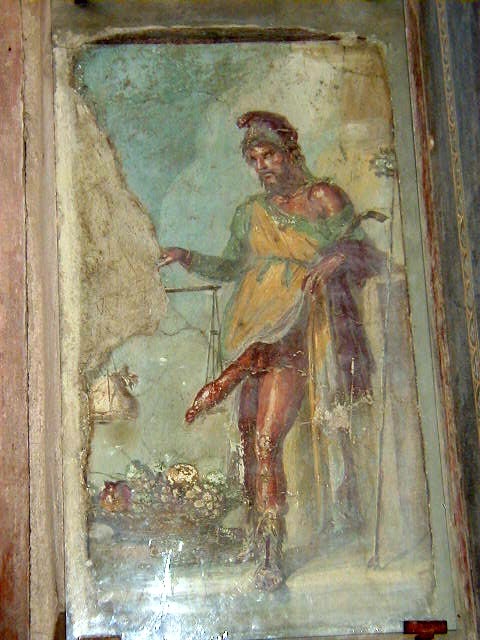 The fresco was placed near the entrance of the house so Priapus could guard against the evil eye from passersby. Water came out of the fountain statue from what you think it came out of. The Romans had a different attitude towards things. If you think these pictures are offensive, you don't want to see the ones I put in the password protected page. 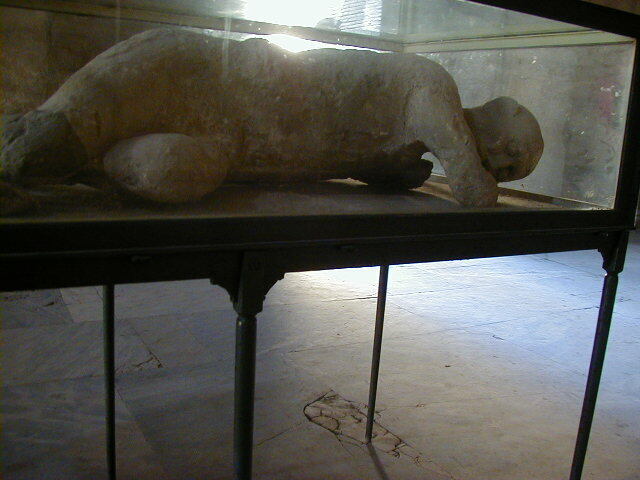 Other interesting pictures I took while wandering around; a mosaic in the entrance of a house with the first know "Beware of Dog" sign, some body casts, including one of a pregnant woman in a glass case, routine Pompeii items in a warehouse near the forum; and another view of Pompeii and Vesuvias. I can't think of a more clever way to present them. Sorry. 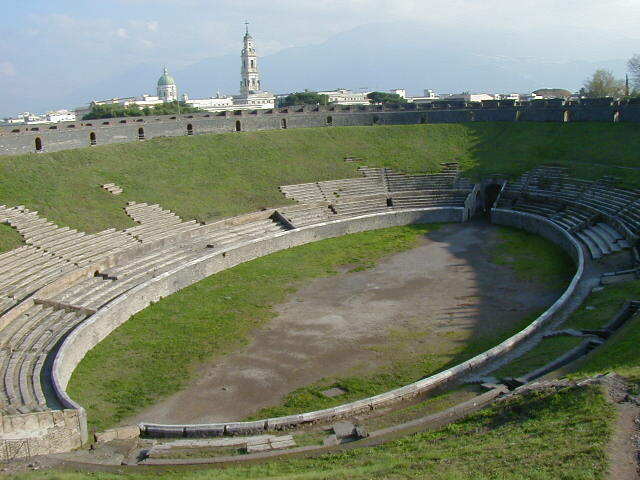 That was it for my tour of Pompeii. 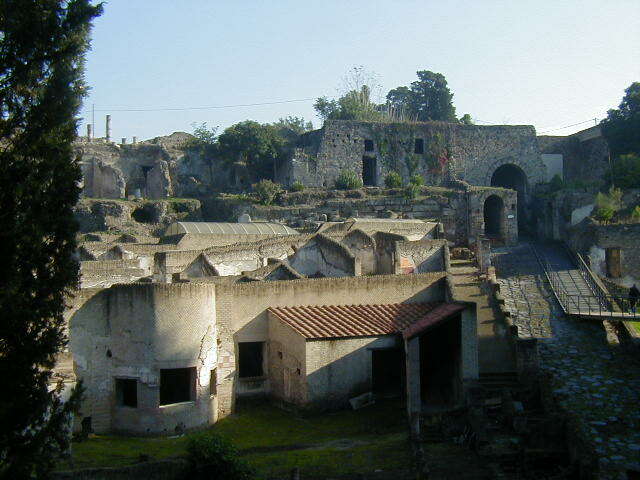 My next stop was Herculaneum.